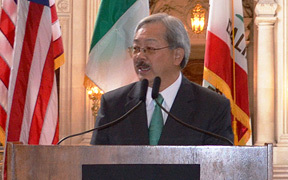 Mayor Edwin M. Lee today presented his proposed two-year balanced budget for Fiscal Year (FY) 2016-17 and 2017-18. The budget for the City for FY 2016-17 and FY 2017-18 is $9.6 and $9.7 billion, respectively. Half of the budget consists of self-supporting activities at the City’s Enterprise departments (the Port, Municipal Transportation Agency, Airport, Public Utilities Commission and others), while the remaining half consists of the General Fund, which supports core services such as Public Health, Police, Fire, and Recreation and Parks.